The need for a funeral loan to pay for immediate funeral expenses is a situation thousands of American consumers find themselves every day due to an unexpected death of a loved one. Many people die each day without having a funded pre-planned trust or life insurance which places loved ones left behind scrambling to gather funds to pay for immediate funeral expenses. The vast majority of funeral service providers (funeral homes), cremation providers and cemeteries do not offer any post death funeral payment plans. 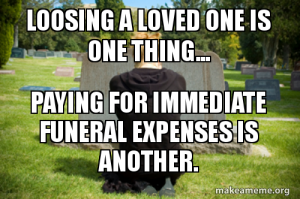 Many Americans struggle financially to pay for immediate funeral expenses of a deceased loved one because of economic pressures and escalating funeral costs. FuneralPayPlan.com offers consumers an easy online funeral loan application with fast response necessary to pay for immediate funeral expenses to the death care provider of their choice. Paying for immediate funeral expenses has never been more simple and the complete application process to deposit takes place from the convenience of a laptop, tablet or smartphone. Access is 24 hours a day 7 days a week with immediate approval upon complete application for the funeral loan. Funds may be deposited into the approved applicants account as soon as 24 hours after initiating the process for the funeral loan. Most important, approved and funded applicants may meet with funeral directors or cemetery professionals to make complete funeral arrangements with the confidence of paying for the immediate funeral expenses which are expected to be paid prior to services rendered. Apply now to get your funeral loan to pay for immediate funeral expenses and allow Funeral Pay Plan to help make the necessary affordable. Great work, i like your blog and your ideas. by this people can pay the immediate funeral expenses without any economic pressures. thanks for the blog.